On April 28, 1986, with the NFL draft looming, the Dallas Cowboys traded disaffected backup QB Gary Hogeboom and their second-round draft pick to the Indianapolis Colts for that club’s second-round draft choice (and a conditional future draft choice that was never exercised). Moving up from the 18th to fourth pick in the second round, the Cowboys took Arizona State RB Darryl Clack, who was primarily utilized as a kick returner over the course of the next four years. The 27-year-old Hogeboom had originally been a fifth-round draft choice of the Cowboys out of Central Michigan in 1980. He saw scant action as backup to starting QB Danny White during his first four seasons, but when White went down with a concussion during the NFC Championship game following the ’82 season against Washington, Hogeboom played well in defeat. With some players unhappy with White’s level of support during the player strike during the regular season, it set the stage for a quarterback controversy. Hogeboom still didn’t see much action in 1983, but Head Coach Tom Landry promoted him over White for the beginning of the ’84 season. While he was tall at 6’4” and had an outstanding arm, and performed ably in a season-opening win, he was deficient at reading defenses and forced too many ill-advised passes. White regained the starting job during the second half of the year as the Cowboys finished at 9-7 and out of the playoffs for the first time in ten years. Hogeboom started ten games and completed 53.1 percent of his passes for 2366 yards with twice as many interceptions (14) as touchdowns (7). Returning to being a backup in 1985, Hogeboom passed for 978 yards and five TDs with seven interceptions and found himself competing with Steve Pelleur, another promising backup. Demoted to third-string quarterback, he demanded a trade and worked out for Indianapolis Head Coach Rod Dowhower the week prior to being dealt. 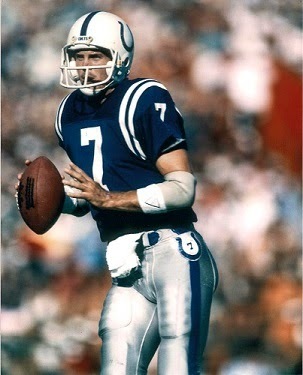 The Colts, coming off a 5-11 record, had the fewest net passing yards in the AFC in 1985 and originally targeted Purdue QB Jim Everett with the fourth choice in the first round, but the Houston Oilers indicated that they would draft Everett with the third pick (as it turned out, they were unable to sign Everett and traded him to the Rams). With the jury still very much out regarding Hogeboom, the Colts also drafted a quarterback in the second round (using the pick obtained from Dallas), Jack Trudeau from Illinois. The starter in ’85, Mike Pagel, was later traded to the Browns. Things did not start out well for Hogeboom with his new team as he went down with a separated shoulder in the second game of the season. The Colts were 0-13 when Dowhower was fired and replaced by Ron Meyer, who made the decision to reactivate Hogeboom and get him back behind center. The result was a 3-0 finish with Hogeboom completing 59 percent of his throws for 1154 yards and six touchdowns along with six interceptions. He played well and showed toughness while rising to the occasion in what was already a lost year. The Colts improved to 9-6 and topped the AFC East in the strike-interrupted 1987 season, but Hogeboom was not a key to the club’s success. He appeared in six games, remained inconsistent, and then suffered a dislocated passing shoulder. In addition, he appeared in the games utilizing replacement players, making him unpopular with his teammates, even if he retained the confidence of Coach Meyer. More significant to the team’s success was the arrival of RB Eric Dickerson in a blockbuster trade during the season. Hogeboom started the 1988 season-opening game, a loss to the Oilers, and then took a seat on the bench as Jack Trudeau, who saw considerable action when Hogeboom was unavailable the previous two years, took over. Trudeau went down with a knee injury that finished him for the year a couple of contests later, but it was rookie Chris Chandler stepping in as the starter, not Hogeboom. The team went 9-7, again with Dickerson’s running the key to success, but with Chandler showing potential. Hogeboom was left unprotected afterward and went to the Cardinals as a free agent in ’89. Overall, over the course of three seasons with the Colts, he started 12 games and passed for 3295 yards with 22 touchdowns and 18 interceptions. Hogeboom signed a three-year contract with the Cards, but lasted just one. While he achieved career highs in attempts (364), completions (204), yards (2591), and TD passes (14) – as well as interceptions (19) – his velocity decreased due to arthritis in his elbow and he was effectively finished after 1989. Waived by Phoenix, he was signed by the Redskins in 1990 but saw no action as a third-string backup in his final pro season. While a courageous competitor, Hogeboom couldn’t overcome chronic injuries and failed to develop sufficiently after exhibiting early potential in Dallas.